The goal is to design a kind of fusor ( Wikipedia.org/wiki/Fusor ). But instead of a fixed inner grid, which causes losses, we try to confine positive H+ and B+ ions with a static electric field and a static magnetic field. Fig. 1. 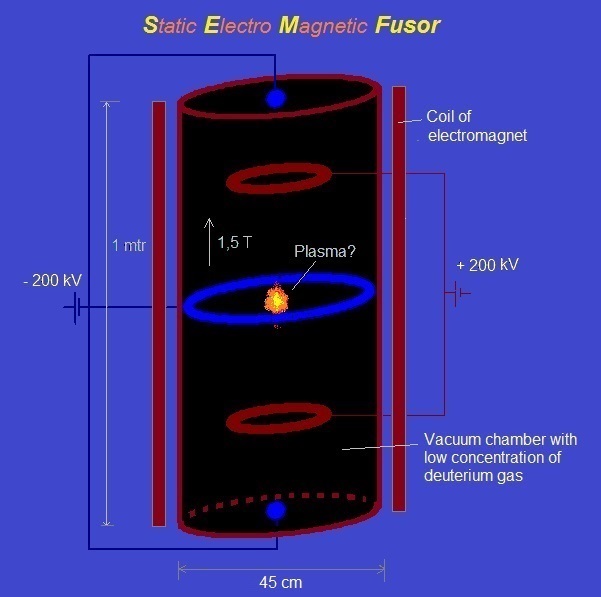 Schematic representation of a Static Electro Magnetic fusion device (S.E.M. fusor?, Sem ). The sphere (vacuum chamber) has been pumped vacuum and is earthed. Above and under the sphere (or around) a magnet is placed which generates a vertical magnetic field inside the sphere. 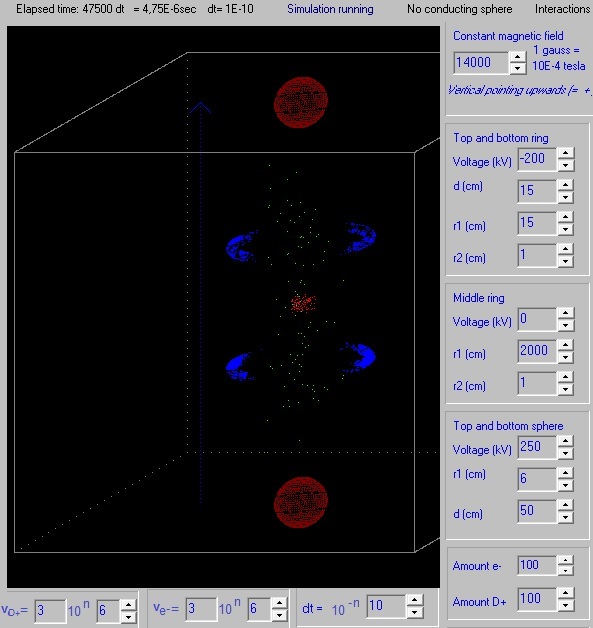 We'll try out several magnetic field configurations in the computer program. An electric field is created by placing eight point charges: four near the top and four near the bottom. In a real apparatus this could be done different (perhaps with rings? see applet), but in order to simulate it easily in our computer program we'll do it at the moment in this way (with point charges). In the middle of each side is also a point charge placed. Fig. 2. 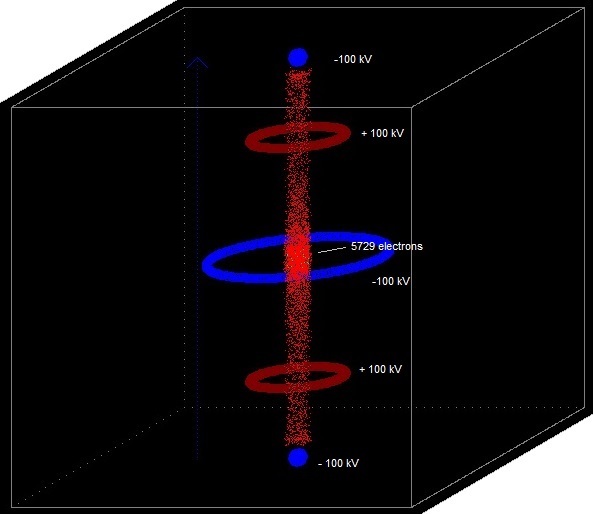 The simulation space, with four positive point charges above and four under ( and one in each side; not in the drawing). The ions have a random initial speed up to 0,5E6 m/s in all directions. A (solitary) sphere with diameter 10 cm and a voltage of +1kV (to infinity) has a charge of: qi= 1000/(9E9)* 0.05 = 5.56E-09 coulomb. 100 kV -> 5.56E-7 coulomb. A (solitary) sphere with diameter 5 cm and a voltage of +2kV (to infinity) has a charge of: qi= 2000/(9E9)* 0.025 = 5.56E-09 coulomb. 200 kV -> 5.56E-07 coulomb . The movement of the positive ions is simulated using Leap-frog integration (see 10.1 experiment10 ). 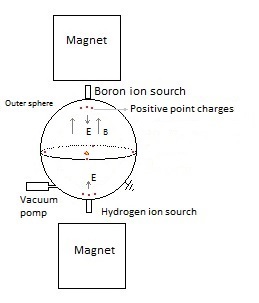 The ions interact amongst themselves and with the electric and magnetic field applying the Coulomb and Biot-Savart formulism ( non-relativistic). 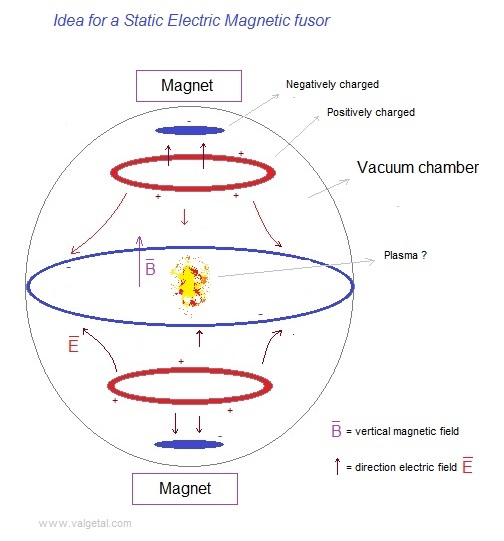 If we use a constant magnetic field of about 1 or 2 T (should be possible to realize..), and a constant electric field generated by the point charges as described before, the positive ions are confined in the simulation space. Even if we give them an initial speed up to 0,5E6 m/s in all directions. At least they are confined during the (very) short time of simulation. The magnetic field is important: if it is decreased the ions escape away to the sides. So far so good.... Could this be a fusor without inner grid? I did a search in internet, but could not find anything similar.. It should be almost impossible that this simple idea has not been tried out already..... However, I got this idea because I have my program, with which I can try out easily different kind of configurations. It took me quite a long time to develop it; could it be that I am the only one so far with a simulation program like this? To check the correctness of the simulation, we will calculate the total energy of all particles. The kinetic energy of all moving particles is calculated (electrons, H+ and B+ ions). The potential energy between H+-H+, H+-B+, H+-point charges, B+-B+, etc. is calculated. When the potential energy between equal particles is calculated in two loops, in the end we divide by 2, see also 10.9 experiment9 . Note: also the potential energy of the moving particles with respect to the fixed charges is calculated. The potential energy of the fixed charges amongst themselves is not calculated (is constant). 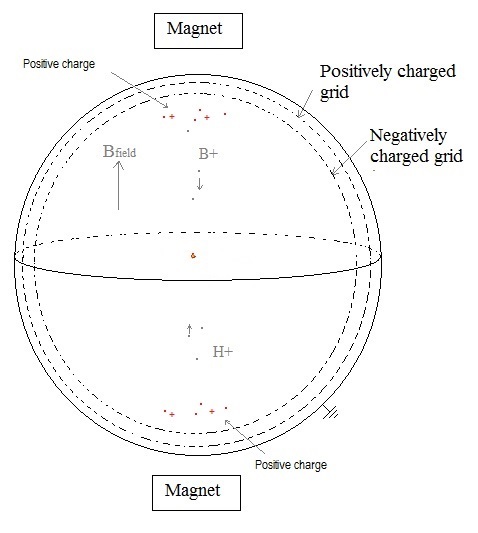 The positive charge of each fixed point charge is: 5.56E-7 Q (100 kV for a sphere with diameter 10 cm), the magnetic field constant 1 tesla, generated 200 H+ and 200 B+ with initial random speed < 0,5E6 m/s. With dt=1E-9 s no ions escaped and the total energy of the particles stayed constant. The total energy of the moving particles stayed constant (within limits) and they stayed confined in the simulation space. Good! 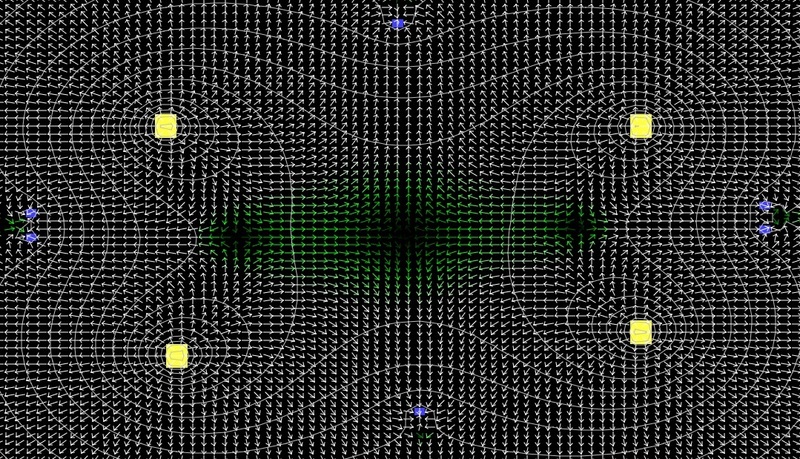 The negatively charged grid must be close enough, so it does not produce a "negative" electric field inside the sphere. But also it must be open enough (with holes), to prevent that too much positive ions collide with it, producing unwanted losses. 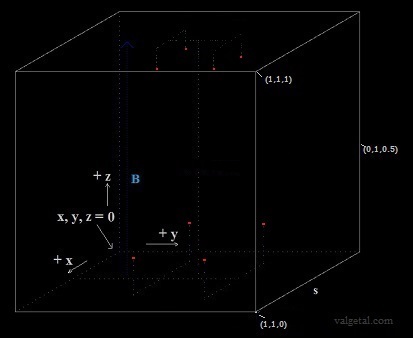 Our simulation space is a cube with a side of 1 m.
Let's take the magnetic field strength 1 tesla. Fig. 4. 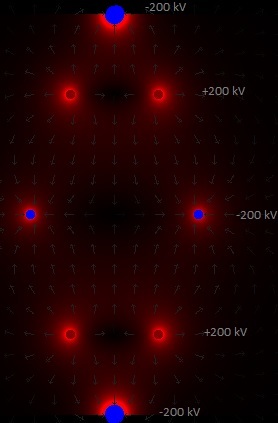 Moving H+ ion in a magnetic field B. 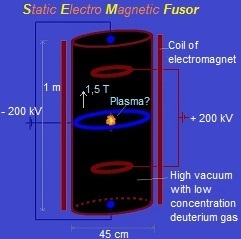 According to https://en.wikipedia.org/wiki/Fusor#Basic_fusion, for fusion to occur the ions must be at a temperature of at least 4 keV (kiloelectronvolts) or 45E6 K.
Assuming this refers to deuterium and tritium, that are easiest to fuse. But let's take this temperature just to get an idea. In euro-fusion.org a temperature of about 450E6 degrees C is /was) mentioned for D-D fusion reaction to occur. In hyperphysics a temperature of 40E7 K is mentioned for D-D fusion. In hyperphysics with ½mv2 = 3/2.k .T (k=Boltzmann constant) we get about the same speed. Also in hyperphysics it is suggested that the currently attainable particle energies in thermonuclear reactors is in the range 1-10keV, corresponding to 0.77E7 K- 0.77E8 K. Filling in 0.77E8 K in hyperphysics we get v ≈ 1E6 m/s (for a deuterium ion). This temperature-speed calculations are not very correct/detailed, but anyway we get some idea about it. It seems to be that with a magnetic field of 1 tesla we could more or less confine D+ particles up to about 2,4E7 m/s. This is ten times higher than the speed needed to fuse ... So the confinement to the sides seems to be okay. In the simulation program we gave the ions an initial random speed in all directions of 0.5 E6 m/s . This is 25 % of the speed needed for D+ to fuse. If we increase this initial speed, some particles escape upwards and downwards (with B=1 T and 200 kV). The problem is to confine the fastest particles upwards and downwards. Increasing the B-field and/or potential is not very attractive.. Perhaps we could place more point charges up and down. 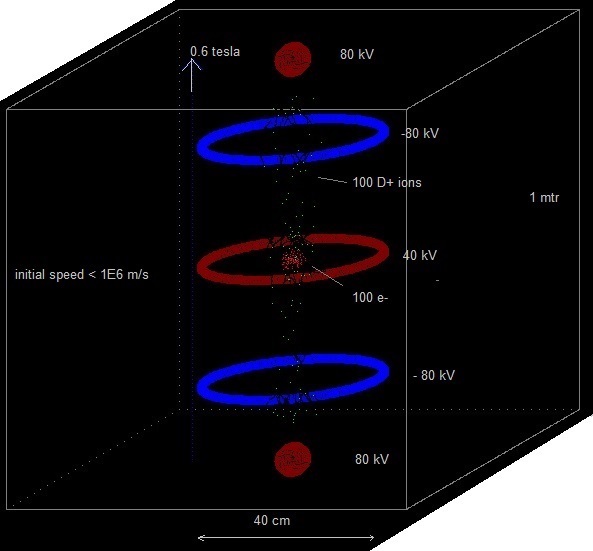 We will investigate this further..
We increased the electric field by creating more positive point charges above and increasing the voltage to 300 kV; applied a magnetic field of 1,5 tesla; generated 20 H+ and 20 B+ ions with an initial speed up to 1,5E6 m/s in all directions, and the ions stayed ... confined! Instead of hydrogen and boron, we will use now only deuterium ions. Massa D+ = 2 x massa H+ . B=1 tesla and 200 kV, initial speed up to 1,5E6 m/s. The ions stayed confined. Also with B=0,7 tesla and 90 kV they stayed confined. 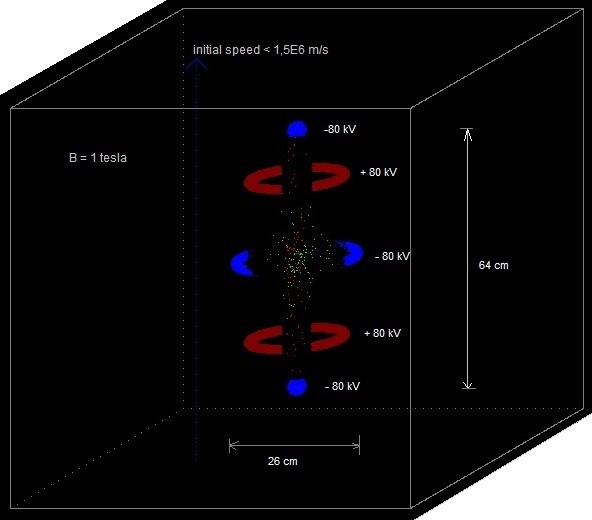 According to experiment 11.7 it seems to be possible to confine positive H+ and B+ ions with random speeds in all directions up to 1,5E6 m/s, in a reasonable (realizable) constant magnetic field of 1,5 tesla and in a reasonable constant electric field . (I assume the electric field is realizable... ). In experiment 11.8 we used only D+ ions (30 particles, also with random speeds in all directions up to 1,5E6 m/s). With B=1 tesla and 200 kV (potential of the point charges if they would be little spheres with radius 5 cm). The ions stayed good confined. In experiment 11.9 we used D+ ions (30 particles, random speeds in all directions up to 1,5E6 m/s). With B=0,7 tesla and 100 kV (potential of the point charges if they would be little spheres with radius 5 cm). The ions stayed also good confined. 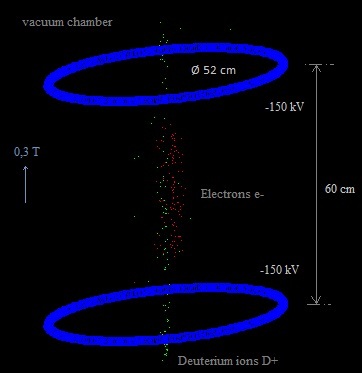 Deuterium is what is usually used in fusors. For fusion to occur, it seems to be necessary to have an amount of 10^18 ions per cubic meter= 1E18 . 1,6E-19 C = 1,6 C ( a lot of charge). If it is mixed with electrons, the net charge will be less. But what do these electrons? I shall have to simulate positive charged conductors, place them in the vacuum chamber and see what happens. Or would it be possible to charge a non-conducting object, which then can be considered as a point charge? How many ions of D+ we need to fuse to get, for example, 100 kWh? -> 3,6E8 / 2,9 E-13 = 12,3 E20 ions. 100 kWh -> 12,3E20 ions -> 4,1E-6 kg = 4,1 E-3 gram of deuterium (1 gram deuterium = 8,78E10 J =2283 ltr diesel). If we use for the up and down positive charges a ring, the electrons are attracted to the ring, but fly through it and will move up and down.. I see this happening in the simulation if I generate electrons. Perhaps an idea. The problem of this Penning trap is (according my opinion) that it can confine only ions of one type (or positive, or negative), and only a few. Would it be possible to modify it to trap both electrons and positive deuterium ions? We will put some negative point charges in the centre of the top and the bottom side. The electrons and deuterium ions stayed more or less confined, although some D+ ions escaped. I moved the negative point charges in the top side 20 cm upwards, and the ones in the bottom side 20 cm downwards. D+ ions and electrons got an initial random speed < 1,5E6 m/s (about 2E6 is needed for fusion) . The electrons and deuterium ions stayed confined! How we could give this simulation shape in the real world? Fig. 5. Possible device that corresponds with the simulation (S.E.M. fusor). Cross section of the electric field according www.falstad.com. The vacuum chamber is pumped empty. Only some deuterium gas is discharged inside. (The best way to do this should be investigated: perhaps most favourable is to inject it along the vertical centre line.) This gas is ionized (I suppose) into D+ ions and electrons because of the electric field . In a "traditional" fusor the positive ions move towards the centre (a point). However, only when they are outside the inner grid they feel the force towards the centre. Once they are inside the inner grid (and they have not collided with it), they will not feel this force any longer (if I am not wrong). In our S.E.M. fusor the D+ will oscillate in a vertical movement (al least in the simulation..). Will the same happen as in a traditional fusor: the positive D+ ions are confined and attracted towards the centre; they collide between each other; some of them get as a result of these collisions higher speeds; some ions with higher speeds collide between each other and fuse..... ? In the simulation there are only a few particles (it is not possible to have more than a couple of hundreds, otherwise it's takes too much memory of the computer and the simulation speed becomes too small). In the program it is possible to turn on and off the interaction between the particles. When there are only a few particles, it hardly influences the speed of the simulation, but when there are more particles, more then 100, then the simulation is running faster with the interaction turned of. 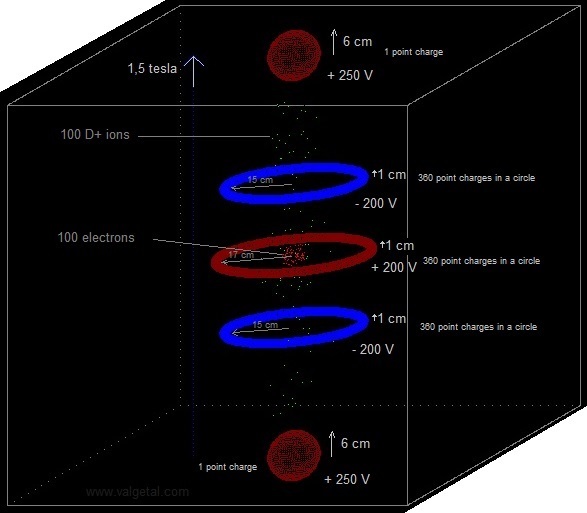 In the real world possibly a cloud of electrons and deuterium ions (mixed together: a plasma), will be confined more or less in the centre of the vacuum chamber. Maybe we should construct this new type of fusor. 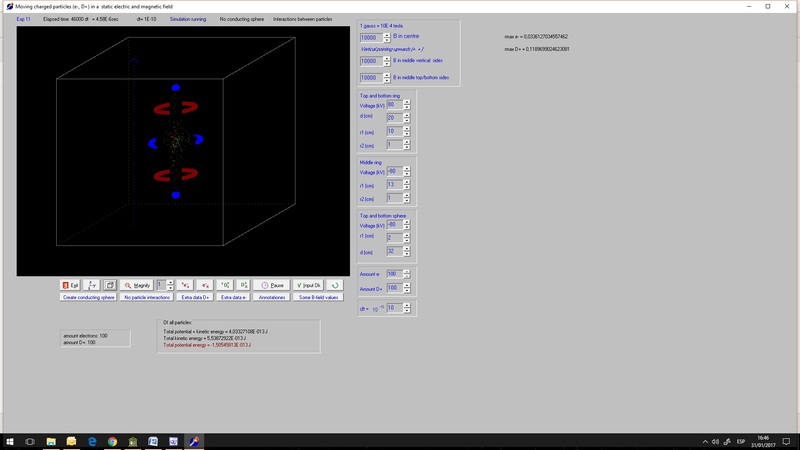 It seems to be not too difficult (at least not a lot more difficult than a traditional fusor), and see what happens..
At the moment I will continue with the simulation program: visualize the electric field, simulate charged ring and ellipsoid conductors , do more experiments.. If the point charges in the sides are positive, the D+ ions escape upwards and downwards. If the point charges in the sides are negative, the D+ ions stay confined. Fig. 6. The simulation space in experiment 11.14a. With an initial random speed < 3E6 m/s (!) the D+ and the e- kept confined in the simulation space (during the short simulation time). Although the simulation had been running about 48 hrs, the real simulation time is very small: 1,2E-5 s.
What I fear is that the particles will spread out sidewards after a larger time period. I will program the maximum distance r from the vertical centre of the particles and see if it increases. It did not seem to increase during some experiments I did. The electrons are now more confined in the centre, but the D+ ions spread more out in the vertical direction, although they do not escape (during the short simulation time). The D+ ions seem to obtain more speed in this configuration (= higher temperature). This would be an advantage to obtain fusion.. Furthermore, the electrons perhaps form a kind of virtual cathode that will attract the D+ ions towards the centre. In the experiment of figure 7b. the positive middle ring has been deleted. The electrons still stay confined and the D+ ions will obtain an higher speed in the centre (I suppose) compared with the configuration of figure 7a. Higher speed (is higher temperature) means more change of nuclear fusion.. However the confinement of the electrons is less compared with the configuration with a middle ring. 4e link Article by D.R. Knapp about fusors etc. The simulation program got stuck (did not proceed any longer) with this amount of particles. What can be seen is that the electrons seems to concentrate near the centre. Perhaps in a real device they would form a kind of virtual cathode and attract the positive deuterium ions towards the centre. Maybe we could use a small inner grid ( as in a Farnsworth fusor) to start the operation . What polarity is the best to be used we should investigate. (fig. 6 or fig. 7). We could construct an experimental SEM fusor with the possibility to reverse the polarities and try out. Put on the voltages of the rings, small spheres and the inner grid. The inner grid will burn, but an amount of D+ ions will have concentrated in the centre. The big question: will fusion take place, as in the Farnsworth fusor? Fig. 12. The electric field. In our SEM fusor the electrons stay also confined! Is it possible to charge the rings and spheres with 200 kV? Q = V.r/(9E9) = 200E3.0,01/(9E9) = 2.2E-7 C.
In www.researchgate.net/ is mentioned "generally, for distances of about 1 cm and pressures of about 10^-7 torr the dielectric strength is ranging from 200 kV/cm to 400 kV/cm. Even larger values are possible for lower pressures". In Wikipedia.org "Field emission in pure metals occurs in high electric fields: the gradients are typically higher than 1 gigavolt per metre". So it seems to be that we will not have problems with dielectric breakdown or field emission, if our fusor has a good vacuum. Applying a mirror magnetic field to the SEM fusor and see if this will improve it. See 11.9 Magnetic mirror simulation. Fig. 13. Applying a magnetic mirror field. By doing so we can decrease (a little bit) the voltages of the charged rings and spheres. It is not possible to simulate more than a couple of hundred particles, because lack of computer power. But let's see what happens if we both increase the mass and the charge of the ions and electrons. In alpha.web.cern.ch/penningtrap a device a little bit simular to the SEM fusor is used, but not for fusion. Here the goal is to trap antiprotons and positrons in order to produce antihydrogen. According to them the electrons cool down due to cyclotron_radiation . "Antiprotons, however, are far more massive. It would take antiprotons over 300 years of sitting in a 1 Tesla magnetic field to cool through cyclotron radiation alone!" That the electrons cool down in the SEM fusor is only favorable, I think. So they form even better a negative cloud: a virtual cathode (I suppose). The protons however should be hot, move with high speeds in order to be able to fuse. "At the center of the Sun, fusion power is estimated by models to be about 276.5 watts/m3. Despite its intense temperature, the peak power generating density of the core overall is similar to an active compost heap, and is lower than the power density produced by the metabolism of an adult human." Some D+ ions obtain speeds till 2,3E6 m/s (more or less in the centre region). An advantage of this fusion reaction with boron is that it (almost) not produces neutrons, which are dangerous and noxious. The simpler the design the better, I suppose..
Or maybe not better, but yes more beautiful. Accelerating D+ ions with a voltage difference of 900 V gives them a speed of 3. 105 m/s . This is only a design, I did not program and simulate it yet. A simulation with only three rings I did already, and it showed indeed the Einzel lens effect. If it would possible to accumulate in the focus point also electrons, this would be advantage. Perhaps changing all the voltages and making the two inner rings positive. I shall have to program more rings, perhaps twelve, with as input their voltages, positions and dimensions. With about 2 millions (dollar or euro) I could buy a building for a lab, magnet, instruments... and do real experiments.